Fundraising Thermometer: As of April 12, 42 generous donors (individual, group, corporate) from our community have raised $34,932! Follow our progress online or at Upbeat Artworks. All donors are invited to colour in the artwork in person at Upbeat Artworks. All donations over $20 receive a Charitable Tax Receipt. Thank you to all the generous donors last year who supported Artbeat Studio, ensuring the continuation of our unique community-based, peer-directed mental health and arts programming. We remain inspired and grateful for such tremendous community support. 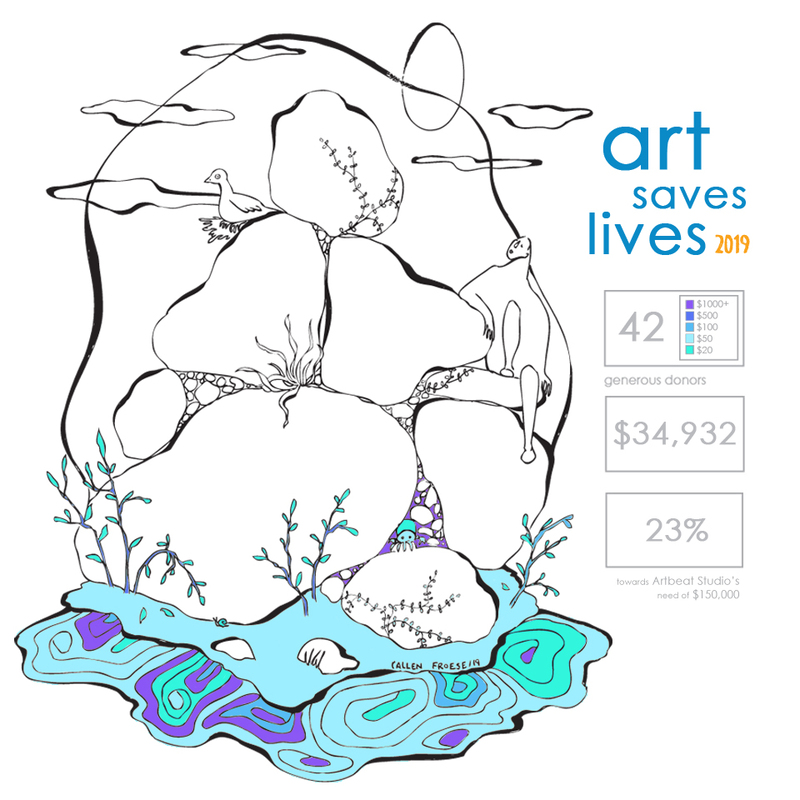 With the Art Saves Lives 2019 fundraising campaign, we ask for your financial support — donate today to keep Artbeat Studio alive! Our goal of $150,000 will sustain programs that directly benefit individuals living with mental illness, for the purpose of recovery and empowerment. Individual, group, corporate, or government donor – we need your support. Help us keep our doors open! Artbeat Studio is in its 14th year of operation and currently runs three major projects that benefit participating artists. The core artist-in-residency program has mentored over 240 artists. Studio Central, Urban Arts Centre is in its 7th year of operation and offers free-of-charge daily art programming, performances, and outreach programs which all contribute to a more vibrant and healthy community serving over 600 individuals each month. Gallery-boutique Upbeat Artworks is a social enterprise open to the public — promoting mental health awareness through the stories and art of Artbeat Studio Alumni. Interested in volunteering for the campaign to keep Artbeat Studio alive? Email us at contact@artbeatstudio.ca.